Christina Dinar is the Deputy Director at the Centre for Internet and Human Rights. She is leading the project Democratic Meme Factory, which studies the impact on counterspeech on youth. Christina is interested in the effect of technology on social norms and practice, especially among youth. She developed with colleagues the concept of ‘digital streetwork’ – a transfer of social work practice into the digital environment. 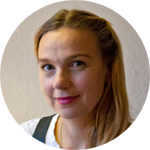 Christina has worked in youth political education for several institutions, such as Friedrich Ebert and Heinrich-Böll-Stiftung with a focus of strengthening democracy and anti-discrimination. She was a project manager for Wikimedia Germany dealing with wikipedias online community enhancing female diversity among into the editors of Wikipedia content. At the Amadeu Antonio Stiftung she developed methods, tools and expertise in the field of hate speech and counterspeech engagement. Christina has studied Social Work in Berlin and also holds an M.A. in Cultural and Religious Studies from Berlin and Jerusalem.